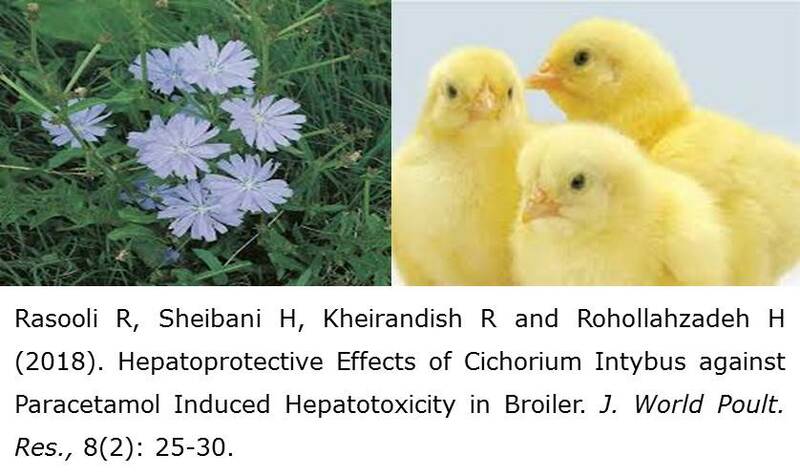 Hepatoprotective Effects of Cichorium Intybus against Paracetamol Induced Hepatotoxicity in Broiler. Rasooli R, Sheibani H, Kheirandish R and Rohollahzadeh H.
Hepatic damage in poultry occurs either due to metabolic or nutritional disturbances or chemical intoxication. The absence of reliable liver protective drugs and also consumption of broiler meat, limit us in usage of chemical hepatoprotective agents. The aim of this study is to evaluate the protective effects of CichoriumIntybus (CI) extract in paracetamol-induced hepatotoxicity in broiler chicks. One-day-old Ross chicken broilers were divided into four groups. One group was kept as normal and liver damage were induced in other 3 groups by oral administration of 1 ml/kg body weight of paracetamol for four successive days. Of 3 intoxicated groups one was kept as control and two different medicinal plants extracts were administered 0.2 g/kg of CI and 0.4 g/kg of CI extract. The medicinal plant was administered orally for 14 days after paracetamol administration. Then the blood samples were collected and the chicks sacrificed to histopathological examination. Serum liver markers and histopathological assessment of the livers revealed that Cichoriumintybus has protective activity against hepatic damage specially at a dose of 0.4 g/kg body weight and exhibited anti-hepatotoxic activity in broilers. The present study showed that administration of Cichoriumintybus extract at the doses of 0.2 g/kg/day and 0.4 g/kg/day respectively to Paracetamol intoxicated broilers, mitigates liver toxicity and liver histopathological changes. Keywords: Cichoriumintybus, Hepatotoxicity, Paracetamol, Broiler. Growth Performance and Carcass Quality of Broiler Chickens Fed Dried Pawpaw (Carica Papaya Linn) Latex. Haruna MA and Odunsi AA. This study is aimed to evaluate the effect of latex of pawpaw (Carica papaya Linn) as a feed additive and crude enzyme complex on growth performance, cell-mediated immunity, carcass and organ measurements of broiler chicken. Four experimental diets each were formulated during the starter (1-28d) and finisher (29-49d) phases such that the basal diets were supplemented with 0, 0.1, 0.15 and 0.2% Pawpaw Latex (PL). A total of 120 day-old Arbor Acre chicks were randomly allocated to the four dietary treatments comprising of three replicates each in a completely randomized design. Performance parameters measured include Daily Feed Intake (DFI) and Daily Weight Gain (DWG) while Feed to Gain Ratio (FGR) and Protein Efficiency Ratio (PER) were estimated. At day 49, twelve birds per treatment were randomly selected for slaughter in order to measure carcass cut-up parts (thigh, breast, neck, wing, back, drumstick and abdominal fat), and selected organs were weighed and expressed relative to live weight. The immunity index was also evaluated. Data collected were subjected to one-way analysis of variance and treatment means separated using Duncan Multiple Range Test. PL contained 54.9% crude protein, 6.28% ether extract, 4.65% crude fibre, 5.5% ash and 18.79% nitrogen free extracts. At the starter phase, there was a general decline in DFI, DWG and FGR as levels of PL increased. Between days 28-49, broilers on 0.1%PL had comparable DWG, FGR, PER and carcass yield with those fed PL-free diet. Hypertrophy of gizzard, liver and intestines were recorded with increase in level of PL. Generally, dietary inclusion of pawpaw latex decreased growth performance but maintained carcass yield, improved immune response and survivability of broiler chickens. Keywords: Carcass, Carica papaya, Immunity, Papain, Performance, Poultry. The Effect of Early Setting inside Single Stage Incubator on Stored Eggs. Jabbar A, Riaz A and Allah Ditta Y.
Eggs weight loss during storage has been documented well due to water loss. 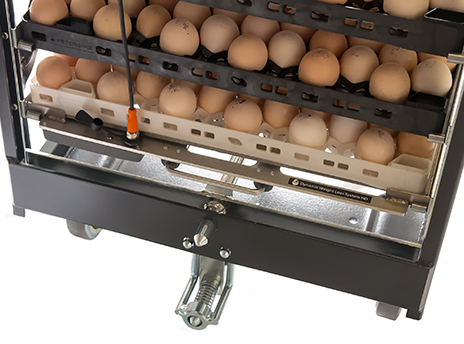 The single stage incubators are designed to use egg water loss as humidity source during incubation. In this experiment one week old eggs (n=430840) were collected in Salman hatchery, Pakistan and divided into two groups, group A was (eggs n=215420) immediately shifted to incubators before 10 hours of incubation to avoid further weight loss) and eggs from group B (n=215420) was stored in eggs room at 23.80 C and 65% humidity with 2cfm/1000 eggs ventilation for 10 hours. After 10 hours of storage both groups were pre-heated at 80 0F for 5 hours leading to incubation conditions. Hatchability % (84.502±2.9221, 84.217±3.0279) candling% (6.5418±0.5605, 6.7682±0.5705) dead in shell% (6.5418±2.3112, 6.7682±2.3702) and hatch window (hours) (22-24±0.142, 26-28±0.1324) were significantly better for A compare to B respectively, Water loss% (11.556±0.1399, 11.545±0.1486), chick yield% (68.835±0.0926, 68.818±0.0928) and chick waste (gram) (19.67±1.721, 19.69±1.7653) were insignificant due to same incubation conditions inside incubator. The water loss from eggs of group A retained inside incubator have an impact on embryonic mortality including the duration of first and the last chick that hatches out. So, the deleterious effects of storage can be avoided by shifting the eggs inside a single stage incubator before 10 hours of incubation including pre-heating. Keywords: Water loss, Egg storage, Single stage incubator, Candling, Dead in shell, Hatch window. Effect of Technological Intervention on the Economics of Vanaraja Chicken Rearing in West Siang District of Arunachal Pradesh, India. Baruah MS, Raghav ChS and Kalita H.
The present investigation was conducted to evaluate the comparative economics of two methods of Vanaraja chicken rearing under backyard system i.e. improved technologies demonstrated under Front Line Demonstration (FLD) and Farmer’s Practice (FP) traditionally adopted by the farmers. All together 120 farmers from 12 randomly selected villages of West Siang district of Arunachal Pradesh having experience of poultry rearing for more than two years were selected for FLD. The study (from August, 2015 to July, 2017) reveals that, the technologies demonstrated in FLDs recorded higher body weight gain of male chickens (2300g) over FP (1800g) at 20 weeks of age, which was 27.78% higher than that of Farmers’ Practice. Mean annual egg production under FLD was recorded as 110 numbers which was 37.50% higher than that of FP (80). The estimated technology gap in body weight gain was recorded as 200 g/bird, whereas for egg production it was 20 numbers/bird. The extension gap of body weight gains and egg production was recorded as 500 g/bird and 30 numbers/bird, respectively with a technology index of 8% in body weight gain and 15.38% in egg production. The benefit cost (B: C) ratio for Vanaraja chicken rearing under FLD and Farmers’ Practice was recorded as 2.62:1 and 1.71:1, respectively which indicated that under improved rearing techniques demonstrated under FLD Vanaraja chicken gives much more profit than that of rearing techniques under FP. Non availability of improved germplasm of poultry (93.33%) was given the top ranking while weak market linkage to dispose the produce (35.00%) was given as bottom ranking in the constraints matrix ranking in poultry production. Under client satisfaction index over the performance of FLD analysis reveals 63.33% of high satisfaction index over the performance of FLDs while 27.50% respondent expressed medium level of satisfaction and only 9.17% respondent expressed low level of satisfaction index. Keywords: Backyard poultry, Front line demonstration, Vanaraja, Benefit cost ratio.